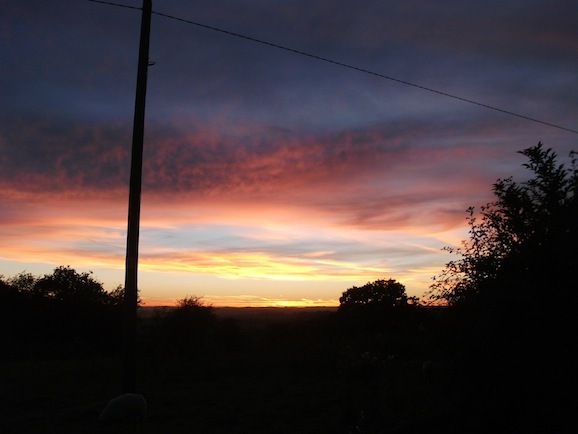 Autumn is the season of wood fires and fiery sunsets. As the sun drops the sky seems to take on a texture all of its own. Crimson fish scales spread out over the deep blue sky before the moon rises. It lights up the thistledown that blows over hedges and casts a milky glow over stubble fields dotted with straw bales. The moon is used by many animals for navigation purposes, including the moths that fly in the shafts of light at the window. 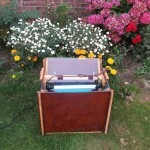 A moth trap is basically a wooden box with a fluorescent light tube that can be used to survey the moths in an area. Moths are drawn to the light and fly down into the box. They are prevented from escaping by clear plastic sheets covering the top of the trap. I was intrigued to find out what autumn moths might be making a home in my garden so I set up a moth trap one clear September evening. Soon moths were spiralling towards the light like fireflies. The next morning I opened the moth trap and, sure enough, moths were hiding amongst the empty egg boxes in the base of the trap. Armed with my field guide, I carefully placed each moth into a clear plastic pot and started to try and identify them. The first moth that I noticed was a wonderful mustard-yellow specimen with a distinctive wing shape. I instantly recognised it as one of the thorns and, after checking the book, I realised that it was a dusky thorn. I also spotted two bright yellow brimstone moths. In my opinion, this moth is equally as beautiful as the butterfly with the same name. The most numerous species in my trap was the large yellow underwing. With wings closed, it looks to be a fairly dull moth. However, when the underwings are exposed, they are a bright yellow-orange colour. This is a clever survival strategy. Flashing the bright underwings as a predator (such as a bird) is about to strike can distract the bird just enough to allow an escape. The Victorian naturalists who described many of our moths came up with some fantastic names. In my trap was a species called the setaceous Hebrew character. It is named after markings on the wings that look like one of the letters in the Hebrew alphabet. Looking through the field guide, I spot other unusual names. True lovers knot is named after a pattern on the wings. The confused is named in reference to the difficulty in identifying this species. My personal favourite moth name is the merveille du jour (this is a beautiful green moth with a name that translates as ‘wonder of the day’). 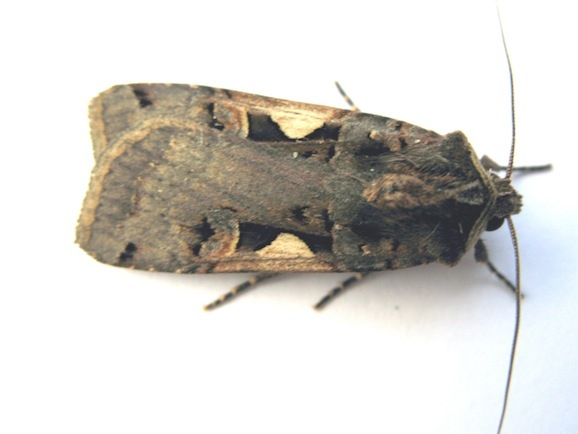 Several years ago, moths hit the national headlines when the oak processionary moth was recorded in London. This is a non-native species that arrived on trees imported from the continent. The caterpillars are covered with hairs that carry a toxin. If this toxin comes into contact with people it can cause serious irritation to the skin, eyes and bronchial tubes. The caterpillars can also defoliate oak trees very quickly. Luckily it seems that the moth has not spread too far into the UK. Another problem moth is the horse chestnut leaf miner. This species has caterpillars that live inside the leaves of horse chestnut trees, leaving brown marks. It causes the trees to produce small, shrivelled-up conkers. Most native moths do not cause any problems and are important pollinators and prey items for creatures such as bats. Being a relative newcomer to moths, I was pleased that I managed to identify nine species in my moth trap. Despite scouring the field guide, I struggled to work out what a small but beautifully marked specimen was. 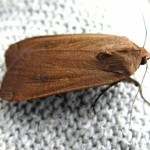 I contacted a good friend who has been running a moth trap in his garden for more than five years. Bill advised me that my final moth was a marbled beauty. This gave me a final count of 30 moths from 10 different species in my small suburban garden. A total of around 2,500 moth species have been recorded in Britain. I thoroughly enjoyed doing the moth survey. It was the first time that I had really studied this wonderful group of insects up close. I shall certainly be setting the moth trap in the garden again to see what other species are present at different times of the year. The best way to encourage more moths into the garden is to plant flowers that are evening-scented. These include honeysuckle and evening primrose, both of which provide a welcome nectar feast for our garden moths. A big thanks to Bill Watkins for providing photos of moths that he has caught in his garden for this article.